Adria is not a manufacturer that’s scared of standing out from the crowd and going its own way. But perhaps the range-topping Astella was a step too far for British buyers: the range with its distinctive front kitchen was phased out for the 2017 season and replaced by this, the Alpina. This new flagship is a range already seen in Europe, but Adria is offering two UK-specific models to the British market: the Alpina 613UC Missouri with an in-line island bed and a central, split washroom and this, the Alpina 613UL Colorado, which has fixed twin single beds and an end washroom. Both are four-berth, single-axle tourers with their habitation doors on the UK nearside, and have been kitted out to cater for the demands of British caravanners. Because the van we reviewed was a prototype, Adria was yet to finalise the finer details of its spec. What we do know is that the maximum chassis weight is two tonnes, and there will probably be two weights available, the lighter of these having an MTPLM of 1900kg. Prices had yet to be confirmed at the time of writing, but the Alpinas are expected to be priced around the £27,000-28,000 mark. So, will this new range hit the spot? And to see other Adria caravans for sale, click here. The first thing you notice is the Alpina’s silver GRP body, intended to build on the cachet of the 2016-season Silver Collection models as well as making the range stand out. However, unlike its special-edition siblings, the Alpina range also has silver front and rear panels in addition to silver sidewalls. These are complemented by the sturdy chrome grabhandles fitted front and rear. The 2017 Alpinas are the only caravans on the British market to use the Al-Ko Delta chassis, designed to give improved towing characteristics that buyers will appreciate, particularly on such a large, single-axle van with a shipping length of more than 8m. The suspension of this chassis will help increase the tyres’ contact patch during cornering and cut body roll, for better high-speed stability and ride quality. In addition to its GRP sidewalls and roof, the Alpina 613UL Colorado, like many other Adrias, has an A-frame that you can stand on to clean the van, as well as heavy-duty corner steadies with guide tubes at the front. Also on the standard kit list are an AKS stabiliser, ATC trailer control, shock absorbers, an Al-Ko secure receiver (although not the lock), alloy wheels, a spare wheel, an external gas barbecue point, a 230V socket in the wet locker and inputs for an aerial in the battery box, an external TV point with a 20A point and two USB points, a manual Thule step, an awning light and Alde wet central heating powered by Alde’s Compact 3020 boiler. All the services are located on the offside. The van is also winterised and has an 80-litre on-board fresh-water tank. The locker door on the front panel is raised by gas struts; inside you’ll see the aluminium floor, plus space for a spare wheel and two gas cylinders. There are also hatches on both sides for external access to the underbed storage. The model photographed has wiring for a Truma motor mover, but this is not standard fit. The idea behind the Adria Alpina 613UL Colorado’s layout is to give the van a large lounge without bringing compromises in other areas and in the first regard, it definitely succeeds. 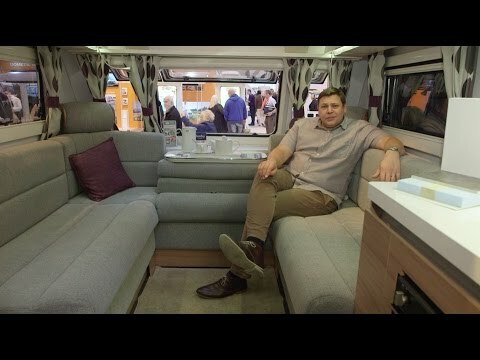 Step on board and you’re welcomed into a generously-proportioned space, but what will probably first catch your eye are the corner headrests, which are rarely seen in British market vans. These fixed, padded headrests make sitting at the corners of the sofas extremely comfortable, providing great support. In fact, the tall seatbacks and deep seatbases used throughout the lounge mean that wherever you’re sitting, you will be comfy and well-supported. Furthermore, because the underseat storage can't be accessed via hatches on the side of the seat bases, this surface is padded so your calves won't bash any hard surfaces. The U-shaped lounge is able to accommodate six adults in comfort. A sturdy, flap-up occasional table can be brought into play if needed, raised from behind the central seatback where a central chest conventionally sits. This can be used alone or in conjunction with the freestanding table, stored conveniently at the lounge end of the kitchen in its own compartment, and secured by two catches. However, the latter table is quite heavy, and getting it into and out of its storage space is awkward. Light floods the lounge through the three front and two side windows, and also the panoramic window that sweeps up the front of the van. All the windows open and have both flyscreens and blinds. At night, three LED spotlights in the panoramic window’s surround are aided by ambient over- and under-locker lighting. Two LED reading lights on adjustable arms mean that you can direct the light where you need it. We like the modern grey and purple tones of the standard Pommery upholstery, which lend the lounge a fresh, clean, contemporary feel without being sterile. Leather upholstery is optional and, although not pictured, loose-fit carpets are included as standard. Another innovation is the concave design of the overhead locker doors which ekes out more headspace (perceived and actual), as well as looking snazzy. Again, we believe this is a first in a British-market van, although this design has been seen in an Adria motorhome. The sense of space is helped further by the fact that the locker doors are light-toned and have a glossy finish; all lockers are fitted with positive catches. A shelf running along the base of the three front windows is perfect for placing a hot drink; there’s also another shelf at the base of the panoramic window. This prototype was fitted with a Bluetooth Media Controller that allows you to stream music from your smartphone or tablet, but Adria isn’t yet sure whether this will be a standard item. If you like music, it’s worth looking out for: pairing your device is simple, it’s easy to operate and the sound quality is impressive. The Adria Alpina 613UL Colorado’s kitchen is very much in keeping with that seen elsewhere in the Slovenian manufacturer’s caravans. It’s bright and modern, the three wide drawers under the sink serving to visually elongate the space. Not that it’s cramped, though; and it’s perhaps here that you most feel the benefit of this van’s almost-2.5m width. You get a good amount of worktop space, and if you require more, a drainer/chopping board fits into the sink and you can drop the cover over the gas burners. Need even more? You’ll find additional space opposite. Cooks will be pleased that a Thetford oven and separate grill are fitted as standard – unusual in an Adria – as are three in-line gas burners, in accordance with the brand’s current style. It’s a neat arrangement that allows any overspill to drain straight into the sink, as well as providing space for pan handles to sit without fear of them being knocked over; it also means that all three burners can be used simultaneously. Above the hob is an extractor fan, plus there’s a midi Heki, so cooking smells won’t linger. The sink is stainless steel and a decent size, with a chrome mixer tap. A 140-litre slimline Thetford fridge with freezer compartment sits opposite, and there’s a bin in the habitation door. Storage-wise, as well as the three aforementioned drawers – all of which are soft-closing and have positive catches, the top one also housing a cutlery tray – there are two large overhead cupboards with positive catches, and there’s the previously mentioned space for the freestanding table to the left of the oven/grill. Opposite is a shelved cupboard with worktop space on top, and it’s here that you’ll find the TV point and bracket, plus two USB points, a 230V socket and an aerial point, with a pair of LED spotlights above. We were pleased to see two further 230V sockets in the kitchen, mounted in the smart, white, glossy splashback. Elegant-looking ambient LED lighting above and below the splashback and the overhead lockers, plus the window and Heki, light the area well. You’ll also see three stainless-steel horizontal channels running across the splashback to the right of the window – Adria supplies hooks and a tray that you can fit in here as needed, to hang or house items. It’s a funky, thoughtful touch. One item not fitted as standard is a microwave. However, the pre-installation for one is in the right-hand overhead locker. Like much of the rest of the van, the ambient lighting in the Adria Alpina 613UL Colorado’s end washroom helps make it feel a bit like a boutique hotel. However, somewhere there had to be a trade-off for that sizeable lounge, and it’s in the washroom – even its snazzy finish can’t hide the fact that it’s a touch tight in here. A mirror running along the van’s back wall to the left and right of the vanity unit helps increase the sense of space. Still, there’s everything else you could need. There’s a Thetford swivel toilet on the offside with a frosted window behind. In the centre is a bowl sink with a chrome mixer tap and a large mirror; the splashback has a stainless-steel groove into which you can hook a toothbrush holder, and there are two LED spotlights above. Beneath the sink is a cupboard. To the right of the vanity unit is some innovative storage that makes great use of the available space – there’s a slide-out unit with a slender shelved cupboard above, and a pull-out rail below. The shower has a bi-fold door and a single drain hole. There’s a slim chrome showerhead, a heater and a drying rail in there, too, with a multi-directional Heki above. You can perch your lotions and potions on the ledge running about a foot off the floor along the caravan’s back wall, although – given the thoughtful touches elsewhere – that there’s no dedicated provision for them at a useful height in the shower compartment seems an oversight. A chrome loo-roll holder sits on the far side of the toilet, with a towel rail on the facing wall. That massive lounge means you get a large make-up double bed across the front of this van – and, measuring 2.25m x 1.67m, it’ll easily accommodate most people. However, the twin fixed single beds are what this layout is about. Both are 0.82m wide, the nearside one 13cm longer than the other at 2m. Both are adjustable, so you can raise the head end for extra comfort when sitting up in bed and reading, with multiple settings. Each bed has a reading light and a window with a curtain, flyscreen and blind, and this area is split off from the front of the van by a curtain. Overhead is a midi Heki rooflight with three LED spotlights. Each bed also has a control panel for the ambient and overhead lighting – in this prototype it was located on the headboards, but will be moved to the side, so as to not be in the way. Wardrobes hang over the foot of the beds, with concave overhead lockers above and underbed storage below. There are three more 230V sockets in the bedroom, too: one on the outside, rear-facing edge of each wardrobe, and one on the side of the offside bed. Space for your touring kit is not something that you’re short of in this van, and it is well-thought-out throughout. In the lounge you’ll find two big overhead lockers and two smaller ones that are full-height, but only the lower portions open. Top-accessed under-sofa storage runs the full length of the U-shaped sofa, although the battery consumes some of the offside space and the externally accessed wet locker some of the nearside cavity. The kitchen also has a pair of overhead lockers, a trio of drawers and a cupboard opposite, while the washroom is fitted with a number of intelligent storage solutions, in addition to the cupboard under the sink. In the bedroom, each wardrobe has a hanging rail – the Alde wet central heating unit stealing a little space from the offside compartment – and there are two overhead lockers per side. Storage under both the fixed singles can be accessed from above and outside, and a light in each space helps you see what you’re doing. The nearside space is empty, while the offside one houses the boiler and water tank. Oozing elegance, style and luxury inside and out, there’s a lot going for the all-new-for-2017 Adria Alpina 613UL Colorado. That both its layout and impressive standard-kit list have been tailored to the British market should help its appeal, and beneath the glitz and glamour it’s stuffed with clever, thoughtful details. Although the tourer tested was a prototype and prices are yet to be confirmed, around £27,000 might be too much for some to stomach. A single-axle van that stands over 8m long could intimidate some buyers, too, even if they have the hefty tow car required to pull it. The pinched washroom might also diminish its appeal to family buyers, but as a high-end van for discerning touring couples, it is certainly a chic choice.